Although man was born free,he however doesn’t hold the free will to lead the life the way he wants to lead or he wishes to lead..It is so because if God makes our life and fate shapes our life; then destiny rules our life and Nature leads our life.. 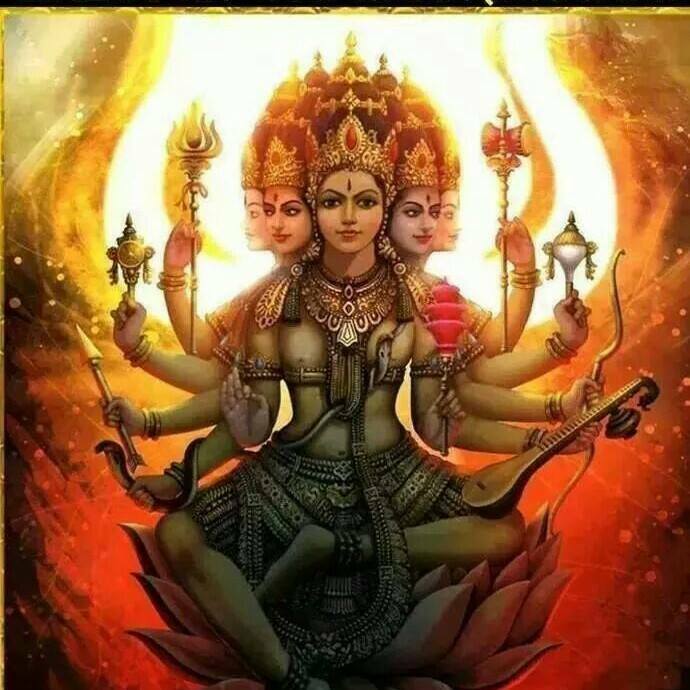 The story of the mystic Brahmin,you are all hereafter going to read,is part of one such amazing cosmic drama Goddess Gayathri has designed for the well being of humanity which She executed to perfection using an ordinary tuition master like Nemani Subbarao as a tool.. The mystic Brahmin Subbarao,even after completing the one crore time recitation of the all powerful Gayathri Manthra,continued his chanting of the same,with a furthermore discipline and a furthermore dedication just because he was instructed to do so by Goddess Gayathri,in Basara..
However,before I take you further into the drama,I need to tell you a few things about the personal life of the noble couple of Subbarao and Venkata Lakshmi.. The activity in the house of Subbarao begins at 4 a m in the morning,everyday..
Firstly,Venkata Lakshmi wakes up,cleans the house and then keeps everything ready for her husband to commence his meditation..Later Subbarao sits for meditation and continues it for several long hours in the day.. This has been the noble couple’s routine for the last thirty five years..
Normally,during the rest of hours in the day Subbarao conducts tuition classes to school and college going students in Visakhapatnam while Venkata Lakshmi spends those hours watching T V or reading books..
Offering tuition to students is what Subbarao still does today to earn for their living and to lead a modest life in the otherwise rich and cosmopolitan port city of Visakhapatnam.. I was furthermore surprised rather shocked when Sri Subbarao told me that he doesn’t even remember when was the last time they both had gone out to a theater to watch a movie..
“Aditya garu,I couldn’t say no to my beloved wife Lakshmi when she asked me recently on her birthday to take her out to some good restaurant..Although it’s against my policy to go out and eat,I still took her out to a vegetarian Brahmin restaurant after carefully choosing one..Those were memorable moments for her..
Now,whatever you all say that I have achieved in my life is only due to her never giving up efforts and unconditional support to my cause..Am still trying to figure our what can this humble Brahmin in turn give this great lady except my unfathomable love and unfaltering faithfulness as gifts to her nobility..
Aditya garu,it really saddens me now to say that just because of my continued silence at home,none of our relatives or friends would visit us nor call us..As a result Lakshmi is confined more and more to a heart breaking loneliness,a never ending solitude and an absolutely stoic silence.. I haven’t for a long time noticed all this pain in her but by the time I have noticed it,more than thirty five years of our precious life have already passed in complete silence without any communication with the outside world..
As long as our daughter Aparna was there with us,we didn’t find and any void in the spaces of our life but once she left us,after her marriage,the empty nest syndrome has mercilessly cast it’s ruthless spell on us.. Were there tears in my eyes after that conversation..May be there were a few..But I silently conveyed my feelings to Veda Maatha..
Now..Let us come back to the story.. In the month of December,2003.. Which must have been just another normal day for ordinary mortals like you and me and to millions of others like us on this planet..
Subbarao was deep in his meditation thinking that it was just another normal day for him too..
However,the poor Subbarao wasn’t aware that moment that he was already chosen by Goddess Gayathri as a vital tool to execute the cosmic drama She was then designing for the well being of humanity..
And he was also not aware that as part of the first act of that great cosmic drama,he was about to receive some very vital instructions from the holy Goddess Gayathri.that day ..
With closed eyes and sitting in a yoga mudra Subbarao was silently chanting the Gayathri Manthra that time..He was all alone at home as his wife Venkata Lakshmi went to see her parents in Hyderabad..
And suddenly at that time,Subbarao heard the divine mesmerizing female voice..
And this was what the voice said..
A shocked Subbarao quickly opened his eyes and looked all around to see the Goddess..But he couldn’t find Her anywhere around…. Although Subbarao felt immensely happy listening to the divine Mother’s voice after a long interval,he was however amused to hear about a very little known place called Naimisaaranyam..
For sure he read about Naimisaaranyam in many mythological stories,earlier in his life,but other than that he doesn’t know much about that place..
“Then where is Naimisaaranyam..? ?..How to go there and why did Mother ask me to go there..? ?..Should I go there all alone or should I take someone with me..How can I take Lakshmi to a forest..What about the wild animals there..What about food and accommodation to us..??.”.. Several questions tormented Subbarao’s mind that day.. He immediately called a few friends and relatives in Visakhapatnam and asked them whether they know anything about Naimisaaranyam or where is it located..
None of them gave a convincing reply to Subbarao..
Those weird replies doubled Subbarao’s confusion..He made a few more efforts and referred to a few more books but could not locate where Naimisaaranyam is..
Then,a fully frustrated Subbarao,on one fine morning,offered his prayers to Goddess Gayathri and requested Her.. The kind Goddess Gayathri although didn’t utter a word that moment silently smiled and kept the much needed information about Naimisaaranyam for Subbarao ready..
After finishing his daily dose of meditation that morning,Subbarao went to one of his students residence in Visakhapatnam to help him in his ongoing exams..But the boy was not there at home that time.. The boy’s mother then made Subbarao sit comfortably in their drawing room and went inside to prepare some coffee for him..Left with nothing much to do,Subbarao sat quietly in a sofa,in that room,waiting for the boy.. The air conditioned room,where Subbarao sat,was very pleasant for him to sit relaxed there..Later,just like everyone of us do when alone in a new room he too looked all around the room..And then looked at a corner table where some books and magazines were neatly placed.. He slowly got up from the sofa and went to that table and picked up a few books in his hands and had casually browsed through the pages..With nothing exciting in them,he dropped them back on to the table..
At that point,a very colorful book drew his attention..He casually picked that book too in his hands..That was the popular Reader’s Digest magazine published by the famous India Today group..
Subbarao then started mechanically going through it’s pages..
After a few pages,Subbarao found a page seeing which he went into a deep shock and remained so for almost two minutes.. There was a small article titled..
Subbarao could not believe his eyes and felt like jumping like a school boy..
However,he calmed himself down and then gleefully started looking all around the room,again,until his eyes stood fixed at one top corner of the room.. He kept staring at that corner without even battling his eye lids.. There was a large beautiful portrait of holy Goddess Lalitha Devi,the principal deity of the most sacred Naimisaaranyam forests,about Whom Subbarao had just read in the Reader’s Digest article..PERIOD..
A much excited Subbarao began his homework for Naimisaaranyam..
However,he was unable to figure out how to convince his wife Venkata Lakshmi for a trip to some wild, extremely dark and dangerous forests like Naimisaaranyam..
“..She came with me to Basara because that is a holy place with some minimum comforts there for a decent living..But how to take Lakshmi to forests where there won’t be any proper accommodation to stay nor proper food to eat..
Subbarao was growing with such wild and incoherent thoughts going on in his mind,that moment.. But Subbarao,as Maya would have it,could not properly read the plans of Goddess Gayathri that moment in spite of having several miraculous experiences in his past.. He would have known that Goddess Gayathri had already chalked out the complete itinerary for his trip to Naimisaaranyam and She had also kept enough supporters to join him on that path breaking trip to that most sacred but the most dangerous darkness filled forests..